A Fanart I made, based on the Charakter "Faith" from the game: "Mirror's Edge" by "Dice"
Great work! Faith is by far my favorite heroine of any game ever. I love the way you use the colours! Brill! Thank you for allowing your picture to be in the group. I just don't know what to say! It's sooooo cool! DICE should make more games. Love the coloring, It's simply amazing! 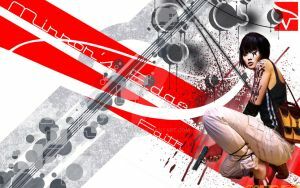 Just from playing the demo alone, Mirror's Edge has to be one of my all-time favorite games, and this art does it plenty of justice. I love all the details. Automatic ! Oh my god I have been looking for this picture for so long. I found it once before but some website had put a giant f***ing watermark on it. I knew someone on dA did this picture. I saw it here wasn't sure if you knew that was there? But this is an awesome picture, I like how it is different from the game and official Faith. Das ist toll! Ich liebe den bg und Faith! This is really good! Good job! Great work! Just letting you know that your art work has been featured in Cre8ive Commando's web design blog in the following post: "Digital art and illustrations of the 50 hottest video game girls". Woaw! This is neat! How long did this take? Nowhere near as amazing as my drawing! Keep up the good work!